This Fox Renard 240 is currently under maintenance in our repair shop, and is scheduled to be completed in late June. The Renard 240 is often regarded as the premier student model instrument on the market today. This instrument is a short bore, thin wall instrument, with a surprisingly deep sound that allows for emotional solos as well as balanced ensemble playing. 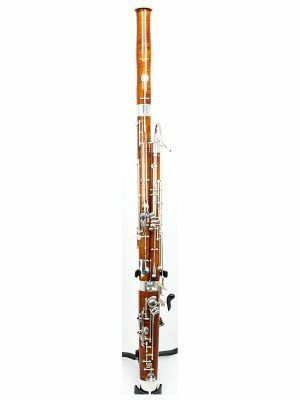 Although intended as a bassoon for students, this 240 has the potential to be used successfully by a skilled, advanced college player or even in graduate school and semi-professional settings. This bassoon comes with 2 Fox *CVX*2 bocals. Please contact us with trial inquiries or questions about this instrument!